Why investors now prefer liquid funds:- Liquidity is an important factor for anybody’s life. Be it the corporate or individual, it is required to have liquidity in your kitty to meet the expenses on a regular basis. Sudden increase in expenses, disruption of cash inflows and unexpected cash outflows are the main reasons why liquidity is important. In general people put their money into savings bank account where they get an interest of 4-6% pa. But the interest of a savings bank account is taxable if the interest is more than Rs. 10000 pa. At times, people put their money in short term fixed deposits. These deposits have better interest rates but tenure is there. SO the question is how to increase your liquidity with a better return in mind. The common answer is liquid funds. Liquid funds invest in a very short term instruments between one day to thirty days. Usually the returns are more than 1-1.5% pa extra than the savings bank account. However, if we look into the past one year performance then it was 8-9% pa return even. Most of the liquid funds do not have any exit load that means any point of time money can be withdrawn from the liquid funds. Even the tax implications of the liquid funds are much easier than others. Liquid funds are considered as debt funds and can get the benefit of indexation. With the benefit of indexation, the tax considerably comes down a lot. 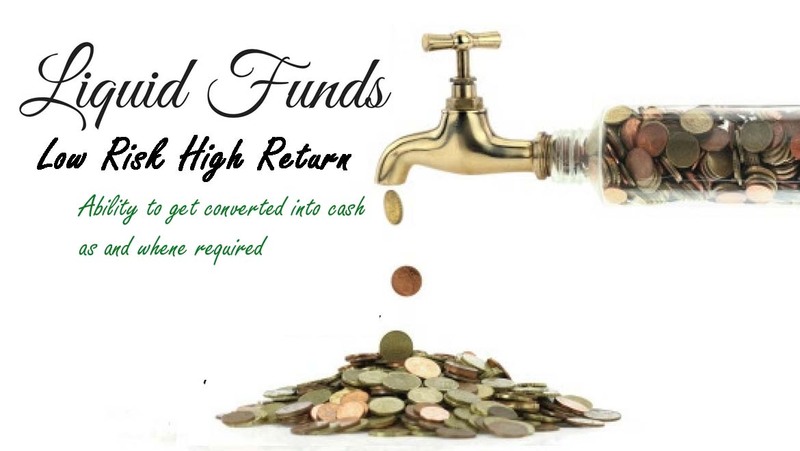 Liquid funds are preferred by the clients for their individual and corporate money deployment. This way one can manage the liquidity/ contingency funding requirements and also earn a decent return on the amounts deployed towards these.